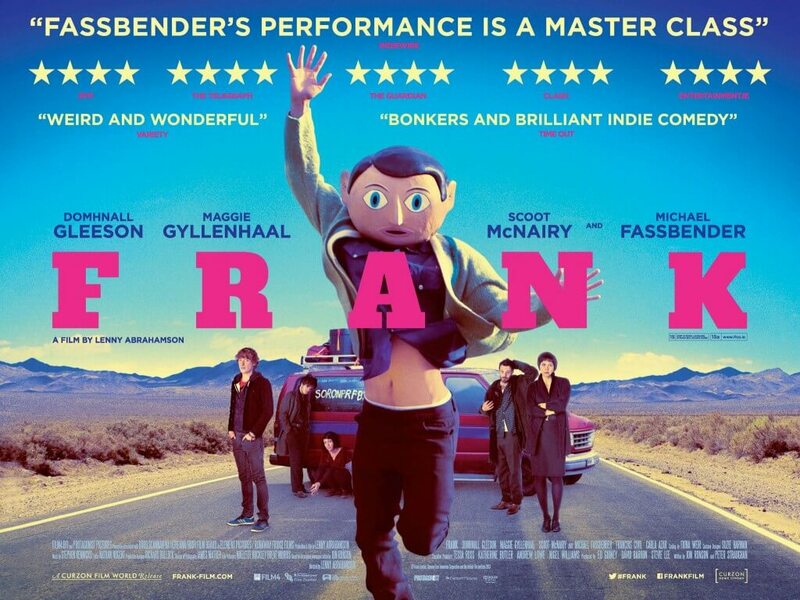 There are only two major things that Lenny Abrahamson’s comedy Frank has in common with the late comic Chris Sievey’s creation Frank Sidebottom – the name Frank, and the giant papier-mâché head. Aside from those things, this film is very much its own little beast which is fine and entertaining in its own right, until the last third when it becomes an unexpectedly moving and poignant study which greatly affected this reviewer. It’s difficult to talk about why this movie is so good without going into the ending, so what’s going to happen here is that all the other non-spoiler elements will be quickly summed up here, and the rest of this review shall be dedicated to those closing scenes. All the actors work well with their roles, with Domhnall Gleeson taking on the “straight man” role with a funny and likable turn; Maggie Gyllenhaal going all-out psycho as a confidante with serious mental issues; Scoot McNairy is memorable as the depressed manager; and Michael Fassbender, as the titular character who remains hidden underneath aforementioned head for most of the film, is an uplifting presence that grabs your attention every time he’s on screen. Abrahamson follows up his (slightly) darker What Richard Did with a clear emphasis and focus on the characters’ eccentricities and individual quirks, and manages to tie everything together in a strong knot. 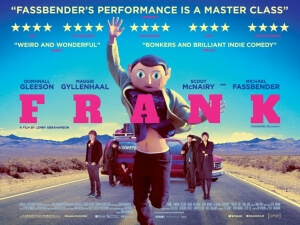 The writing is witty, the comedy gets a good few laughs, the heavier moments are affecting, it’s clear that Frank is a well-made film which should earn its cult status fairly quickly. All that is blown out of the water, however, by the powerhouse last third. Which, by the way, means that now we are getting into MAJOR SPOILER TERRITORY, so if you want to go into this movie knowing nothing about it then stop reading right now or scroll down to the “SO, TO SUM UP…” bit at the bottom of the page. We mean it. Spoilerphobes, stop reading. RIGHT NOW. This is the point of no return. After a series of events lead to Frank running away, Gleeson’s Jon eventually finds him at his parents’ house in Kansas. There, not only do we see him unmasked for the first time but we learn more about his real persona: he is described as having an undisclosed mental illness with a poor lack of social skills (he struggles to even look Jon in the eye), along with unexplained scars across his forehead. He also displays a severe lack of self-confidence with himself, which is only fixed when he reunites with his former band members and sings the type of music he wants to sing. This is when it hit me (yeah, sorry to get all first-person here, but by this point do you really care?). His identity as the literally big-headed musician Frank was all this time the real Frank’s therapy. I took from it that he had a severe case of autism, possibly even Asperger’s like I myself have, and that by forming the band and making strange music with them was therapeutic for him to, as it were, come out of his shell and face his band for the first time with his own eyes. These last scenes of the movie personally affected me because it reminded me of how I couldn’t cope with social skills when I was younger and at school. Half the time, I too wanted to hide underneath a mask as Frank does in this movie and only then would I have the confidence to be an entirely different person. Eventually, because of the people I met along the way as Frank does with his fellow band members, I was able to shun the mask once and for all and look them in the eye. It was because of my own “Soronprfbs” (the band’s name) that my confidence got to where it needed to be despite my condition. For that, I heavily praise Abrahamson, writer Jon Ronson, the actors and everyone else who creatively worked on Frank for not only being an entertaining movie on its own, but also having the ability to strike a personal chord with anyone who may have felt as self-ostracised as its titular character does, and remind them that no matter how tacky their papier-mâché head is there’s always the option to remove it and see everything for what it’s worth. In case you scrolled down to here from earlier in the review, Frank is a hearty comedy-drama with some excellent performances and solid, confident directing and writing. The final third, however, is where things become much more poignant and personal (for this reviewer, anyway), making it more than worth the ticket price.